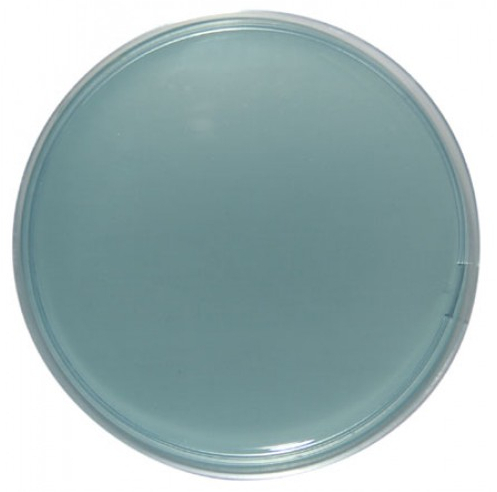 CLED Agar is an abbreviation for Cystine Lactose Electrolyte-Deficient Agar. It is a type of differential medium recommended for diagnostic urinary bacteriology. The medium supports the growth of all urinary potential pathogens and provides distinct colony morphology. CLED Agar also supports the growth of a number of contaminants such as diphtheroids, lactobacilli, and micrococci. It is electrolyte deficient to prevent the swarming of Proteus species. Enzymatic Digest of Casein, Enzymatic Digest of Gelatin, and Beef Extract provide the nitrogen, vitamins, and carbon in CLED Agar. L-Cystine is added as a growth supplement for cystine-dependent coliforms. Lactose is the carbohydrate. Organisms capable of fermenting lactose will lower the pH and change color of the medium from green to yellow. Bromthymol Blue is the pH indicator. Agar is the solidifying agent. Suspend 36 g of the medium in one liter of purified water. Cool to 50°C, mix well and dispense into plates. When the medium is solidified, invert the plates to avoid excess moisture. The prepared medium should be stored at 8-15°C . Prepared Appearance: Prepared medium is trace to slightly hazy and light grey-green. Inoculate the specimen. Incubate plates at 35 ± 2°C in an aerobic atmosphere. Examine plates at 18 to 24 h for amount of growth, pigmentation, colony size and inhibition of Proteus swarming/spreading. Escherichia coli yellow, opaque colonies with a slightly deeper coloured centre about 1.25 mm diam. 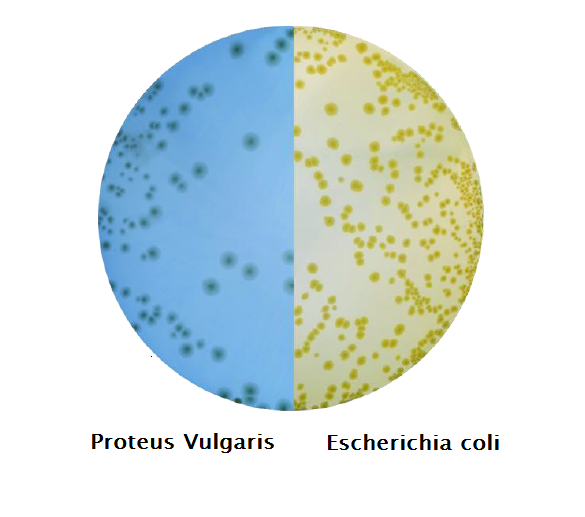 (Non-lactose fermenting strains – blue colonies). yellow medium. Streptococci and other organisms requiring blood or serum for growth may only be insufficiently recovered on this medium or may need extended incubation. Therefore, the specimen should also be cultivated onto a blood agar plate if such organisms are expected. Genitourinary pathogens such as Neisseria gonorrhoeae, Gardnerella vaginalis, Chlamydia, Ureaplasma, or other fastidious organisms do not grow on this medium. Although a differentiation according to lactose fermentation and certain other diagnostic tests may be performed directly on this medium, biochemical and, if indicated, serological testing using pure cultures is necessary for complete identification. why the color turns blue in case of (salmonella spp. )?